If you're looking for a way to pep up your practice, here's a useful new tool. 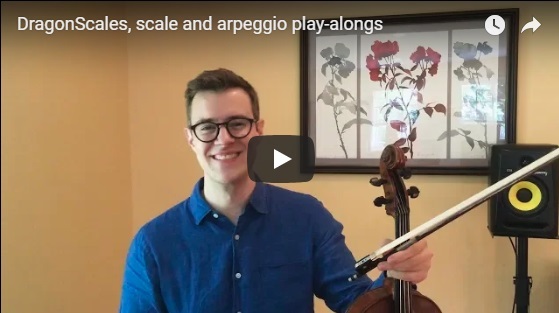 Violist Nick Revel (PUBLIQuartet) created DragonScales, a set of downloadable mp3 audio play-alongs, to make practicing scales and arpeggios easier and more effective. He created them for his own use but found them so useful, he's offering them as a digital product. 8 audio play-alongs including: major, minor, whole tone, diminished, and chromatic scales, as well as arpeggio progressions. All move through challenging rhythmic accelerations, starting slow, getting really fast, and reversing to slow. The included Supplemental Rhythm Guide notates the rhythmic progressions for each scale and arpeggio. Audio moves with you in perfect unison through rhythm changes so you can always tell if you are playing in tune, in time, and with good sound. The C Major set is available free here (scroll down and click on the C Major file). Other keys are available on amazon.com ($7.12 per downloadable set) and on Apple Music.